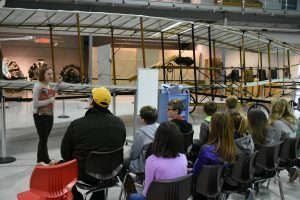 The National Air Force Museum of Canada (NAFMC) offers today’s educators a variety of ways to use its unique collection to support classroom teachings. 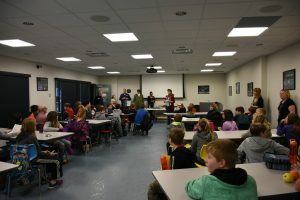 The most popular approach is without a doubt one of our Interactive Education Programs, facilitated by our enthusiastic and knowledgeable volunteers. 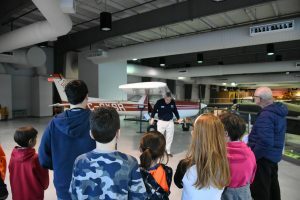 Many of them have life-long experience in the subject matter as a result of their military careers or their personal involvement in the civilian aviation world. The aircraft and exhibits in the NAFMC are arranged to guide visitors along the “Path to our Past”. This pathway traces the history of Canada’s military aviation accomplishments and achievements through a wide array of displays and images. Let our education facilitators amaze you and your students! The shared life experiences along with the theory related pieces that are aligned with the Ministry of Education curriculum guidelines reinforce classroom instruction. Thus, allowing the students to learn in a creative way, for a better and more thorough understanding. to divide students into smaller groups accompanied by parents or chaperones. Group Size: Please ensure adequate supervision for your group. Duration: Please allow one or two hours for your visit. Teachers are entitled to a free onsite consultation to help plan their trip. Please call the Education Programmer to discuss timings! collection on your own, take health breaks, enjoy lunch, visit the gift shop, etc. Don’t forget to bring a camera to document the fun! Staying for lunch? Please ask the Education Programmer about lunchroom facilities and availability. Please make a reservation at least three weeks in advance. Call 613-965-3874 or email your request to education@airforcemuseum.ca. The Education Programmer for the museum will call you before your visit to review the details of your scheduled program. Let us know of any special needs, such as learning or physical disabilities, and vocabulary and language levels. Please note that this information will allow us to better prepare for and meet your needs. The museum is fully wheelchair accessible. Interactive Education Program fees are generally charged at a per person rate of $6* per student plus HST. A minimum fee per group will be charged, depending on the program. All accompanying adults per group are admitted at no charge. Parking is free and lunch space is provided if desired. Payment may be made in advance or on arrival by Cash, Cheque, Money Order, MasterCard, Visa or American Express. Please make cheques, etc. payable to The National Air Force Museum of Canada. *Please note that all prices are subject to change. Thirty days’ notice will be provided. The Museum requires due notice of cancellations (by phone, e-mail, fax, or in person) 1 week in advance, except in cases of inclement weather. Failure to do so will result in the CONTRACT or INSTITUTION (as appropriate) being charged 50% of the originally cited Program Fee. For a program cancelled with more than 1-week notice, a $20 administration fee will apply, unless the program is rescheduled within the same school year. In the case of school bus cancellation due to inclement weather, this fee will not apply if a school reschedules the cancelled program within the same school year.